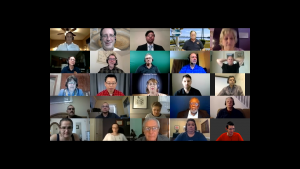 I recently organized a “Mini-Webinar Contest” for Online Presenters, a Toastmasters club that meets online and focuses on helping members develop the skills needed for webinars and online presentations. If you are trying to sharpen your digital presentation skills, I recommend you consider organizing a webinar contest of your own. We got help from Roger Courville, who attended as one of three “celebrity guest judges” we invited to give the contestants professional feedback. That was one of the things that made this event special, amplifying the verdict of the judges and identifying common themes in what the contestants did well and what they struggled with. If you’re not familiar with Toastmasters, it’s a public speaking and professional development organization where the educational program is delivered peer-to-peer, with members evaluating each other. There are manuals that lay out speech project criteria, but the quality of feedback varies from evaluator to evaluator and club to club. Some Toastmasters go on to become professional speakers, but most are looking to improve the way they present themselves at work, or in a job interview, or the next time need to make their point at a school board meeting. Part of my theory about the value of taking Toastmasters online is that online presentations are becoming an everyday part of many of our work lives and social lives, thanks to Skype and Zoom and Facebook Live. Not every member of Online Presenters will wind up delivering professional webinars, but some of them will, and others will find the skills they learn in the club personally and professionally useful. One of the most valuable things Toastmasters offers is practice, and lots of it. You make your mistakes among friends so that when you get a chance to give a keynote speech or a toast at a friend’s wedding, you will do a better job of it. In a club that meets online, you get experience fumbling with the technology and having it fail you. As a result, when you present professionally you are more likely to use the screen sharing controls properly and less likely to become hopelessly rattled when a technical glitch occurs. That’s the value of the regular meetings. The value of contests is different. In a contest, you show the skills you have mastered and measure yourself against other competitors. That’s why we invented an unofficial Toastmasters contest of our own, specifically for online presentations. The best known Toastmasters contest, the one that ultimately leads to the selection of a World Champion of Public Speaking, is the International Speech Contest: a 5-7 minute compressed version of a keynote speech. 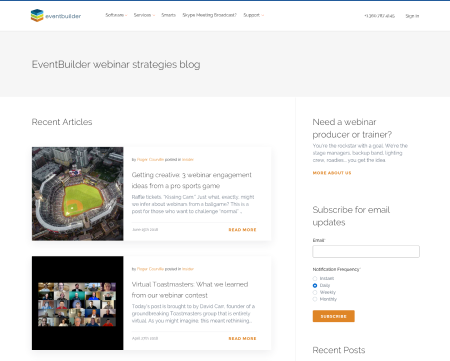 Our “Mini-Webinar” format is a 6-8 minute online presentation that is supposed to include some audience interaction (responding to questions submitted via chat) and a call-to-action. While it may be true that no one gives 6-8 minute professional webinars, no one gives 5-7 minute keynotes, either, but in both cases the challenge is to demonstrate the required range of skills. Our first contest did not go perfectly. One speaker was confused about the time requirements, apparently was unable to see the signals from the Timer that he was running long, and left me feeling I had no choice but to interrupt him to prevent the entire event from running over schedule. A second contestant also appeared confused about the timing and didn’t realize there was no time left for him to respond to questions. A third contestant was unable to figure out how to share his screen and wound up speaking without slides (he got third place, despite that). These were all variations on problems that have cropped up regularly in the ordinary business of the club. Timing turns out to be one of the trickiest elements of the online environment. In a traditional Toastmasters meeting, a Timer uses either a timing light device or green, yellow, and red flash cards to signal how close the speaker is to running out of time. In the online environment, that can be tricky. Our online meetings platform is RingCentral Meetings, which is based on Zoom, and shows each participant’s webcam feed as a thumbnail image. However, when you are sharing your screen only a few thumbnail images are visible, and the image of the Timer might not be one of them. While there are technical fixes to this issue, my best advice to presenters is to time yourself with a stopwatch or an app on your phone so you have an independent way of knowing if you’re about to blow past your time limit. At the end of the meeting, I quoted the pilot’s saying, “Any landing you can walk away from is a good landing.” We had fun, learned a lot, and know that next time will be better. Practice is the best way to get better. Judging/voting forms: David and the crew used an online tally system that was created by Toastmasters. Each contestant could be rated on a scale via a dropdown in multiple categories. The idea was perfect, albeit (if I remember correctly, David and team edited it a little to accommodate the online nature of the content/contest). You could probably accomplish the same thing with SurveyMonkey or similar system. Hats off to David– it was well thought through. Seeing the timer: The contest’s timer had ingeniously used a green screen to change his background, including a digital display of the colored cards that indicate “time remaining” to the speaker. How RingCentral/Zoom dynamically handles video and who it shows you, however, meant that to keep the timer’s video in view meant needing to “pin” it. This might be a hurdle for those whose experience with conferencing is low. Duration and interaction: To David’s point about nobody giving 7-minute keynotes, this is a good thing to think through. Most webinar presentations aren’t keynotes (and shouldn’t be), so if you think about taking a minute to run a poll or use some form of interaction, that’s a rather painful slice of the allotted time. Thus, mimicking a best-practice for a learning environment is tough. That said, a presenter could allude to a means of interaction instead of just doing it (and thereby demonstrating their competency). They could also improve on their ability to respond to comments in real time – a powerful presentation tactic that is unfortunately poorly reflected in the Toastmasters’ way of teaching the craft of speaking. Hats off again to David and team for some groundbreaking work. As he said, it makes a lot of sense in the world and makes a lot of sense for Toastmasters. Thanks again for the invite to be part of it.